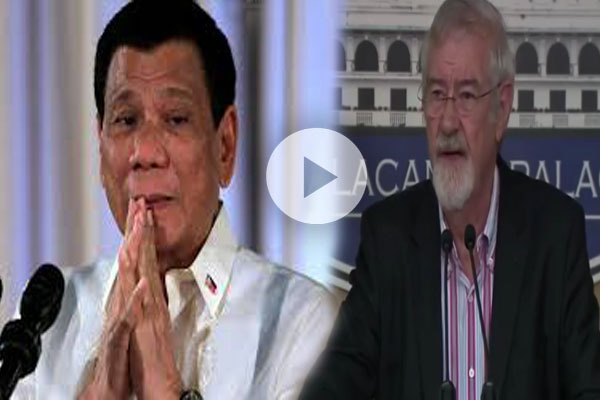 In a press briefing in Malacañang on Wednesday, October 5, Peter Wallace, an Australian businessman congratulate President Rodrigo Duterte for his accomplishment and achievements during his 100 days in office. “I’ve been studying this man for quite some time. I’ve known him for quite some time. This is a man who genuinely cares for this country and genuinely cares for its people. And what I particularly like, he cares for what really matters like in the provinces where we have the poorest of the poor and the people suffering the most,” Wallace said. Wallace is a known business man who has lived in the Philippines for four decades. Wallace particularly impressed when Duterte signed an executive order of the "Freedom of Information" which he said should have been done a long time ago. The businessman also defended the President’s “radical” style of leadership in the country that was being portrayed in the media. “He’s angry and he’s frustrated and he takes this out by swearing, which is not terribly abnormal in the society that he is mixed in. But it is difficult for particularly foreigners to understand,” he said. “And what happens unfortunately is too often what he says is taken literally rather than interpreting what he actually meant. Because if you do that, you find that most of the swearing is just top of the head type of stuff, that doesn’t have any real importance to it, that isn’t the real intent. It’s underlying that behind that really matters. And what’s underlying behind that is that he wants change and he wants to get things done,” he added. Sponsor Wallace believes the President is not cutting ties with the United States despite his recent pronouncement of establishing economic ties with Russia and China. “He’s trying I think to establish that the Philippines is a truly independent country. It is no longer a colony of the US. It is no longer subservient in any way to the US. It wants its independence and in a fairly dramatic way that he’s trying to put that across, right? Now, it’s an unusual way,” he said. Wallace also gave his opinion on the issue of extra judicial killings. “I don’t see it affecting business particularly. There’s no question that there has been concern raised by some of the foreign business community over these but nobody, nobody is withdrawing. No companies are going out but business is not affected directly,” he said.